His highest Test score of 294 came against India at Birmingham during the 2011 series. Former England skipper Alastair Cook is playing his last international Test match. 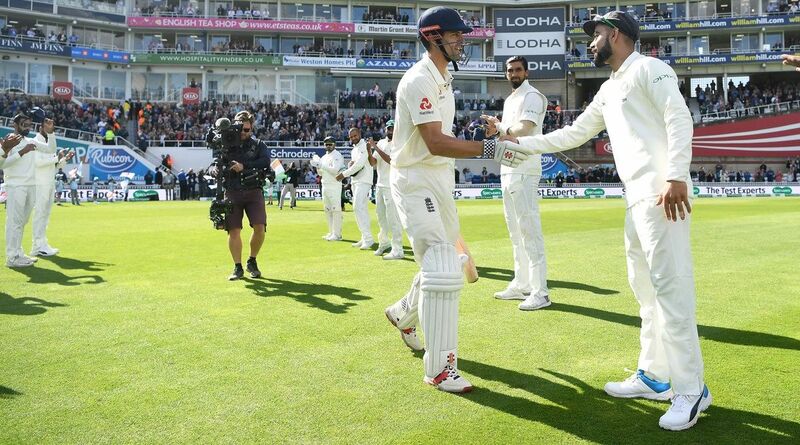 On the occasion of his final Test, he received a guard of honour from the Indian team, a handshake from Virat Kohli and a standing ovation from the Oval crowd as he walked out to bat. The ongoing Test match between India and England is Alastair Cook’s last Test for England after which he will retire from international cricket, a decision which he took earlier this week following a prolonged lean patch. England skipper Joe Root won the toss and elected to bat against India in the last Test of the five-match series. The hosts have taken an unassailable 3-1 lead in the rubber. As the batting great walked out to bat, he got a guard of honour from the visiting side, at the end of which he shook hands with captain Kohli. In 161 Tests, the country’s highest run-getter has so far scored 12,254 runs at an average of 44.88 with 32 hundreds and 56 half centuries. Cook led his side to a famous 2-1 Test series win in India in 2012, one of the highlights of his captaincy. Not just captaincy, Cook also excelled with the bat during that series, scoring 176 at Motera, 122 at Mumbai and 190 at Kolkata. However, he has had a poor series against India this time around, scoring only 109 runs in seven innings across four Test matches, and his place was under the scanner. “After much thought and deliberation over the last few months I have decided to announce my retirement from international cricket at the end of this Test series against India,” Cook had said in an ECB statement.